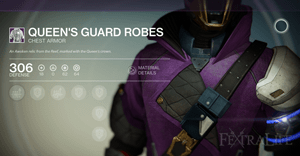 Queen's Guard is a Legendary Warlock Armor in Destiny. Pieces of this armor require the player to be Level 20. Each piece of armor comes with a bonus to Discipline, Strength or Intellect. Each piece of armor has Armor Upgrades and these are shown in the spoilers below the screenshots. 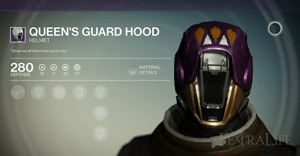 This armor has TYPE 1 COATING - This Armor can be recolored using version 1 or newer micromaterial shaders. Note There are also Hunter & Titan versions of this armor.